Overview Lung cancer is the leading cause of cancer deaths in men and women. 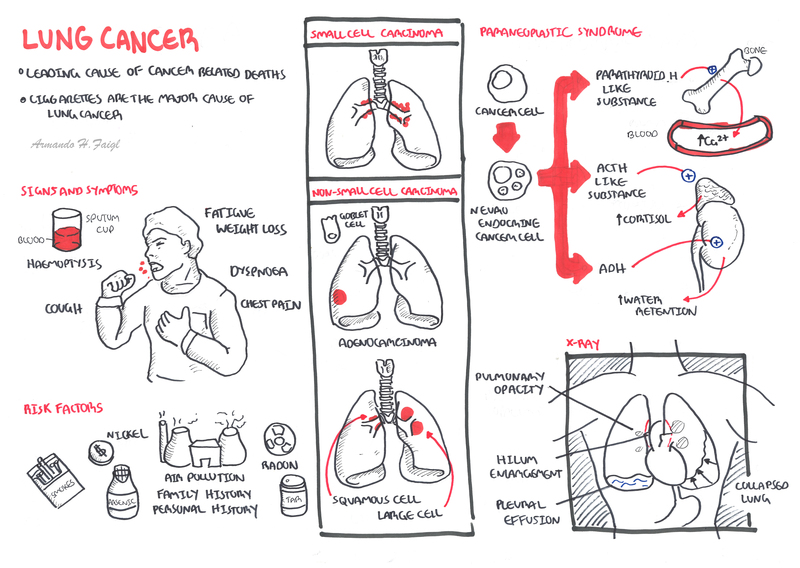 Lung cancer can be divided into small cell and non-small cell carcinoma. 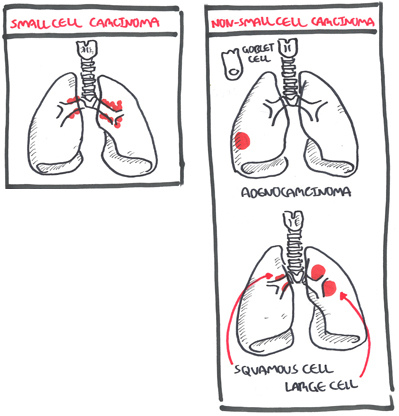 Small cell lung carcinoma presents late stage and has poorer prognosis. A solitary pulmonary nodule measuring 8 mm or less can be followed radiographically. For larger lesions, a biopsy, whether bronchoscopic, percutaneous, or surgical, should be considered. 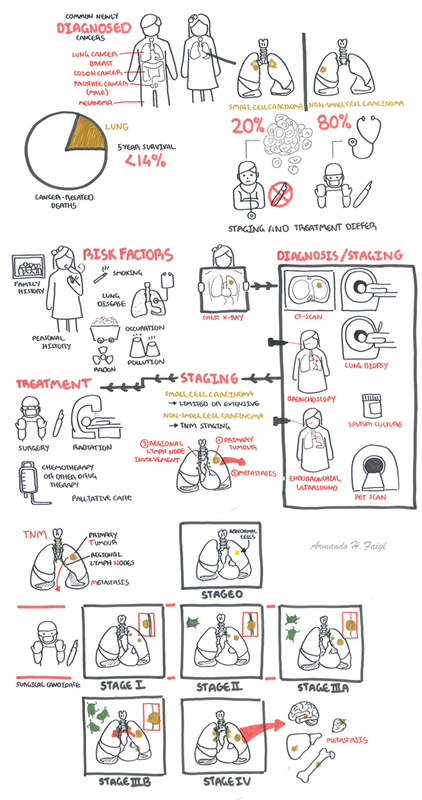 Steps in management of a patient with suspected lung cancer include tissue diagnosis, staging, preoperative evaluation, and treatment with surgery, radiotherapy, or chemotherapy. Horner Syndrome: Symptoms are ptosis, loss of pupillary dilation (miosis), and loss of sweating on the ipsilateral side (anhidrosis) caused by compression of the superior cervical ganglion and resultant loss of sympathetic innervation. 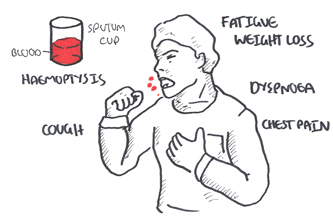 Superior Vena Cava syndrome: Obstruction of venous drainage, usually by external compression of the SVC, leading to edema of the face, neck, and upper part of the torso often with formation of collateral veins on the upper chest. Think Most patients with hemoptysis require evaluation with bronchoscopy. Massive hemoptysis may result in death by asphyxiation. Investigation Chest x-ray findings can vary in patients with lung cancer and can include pulmonary opacity, hilar enlargement, pleural effusion and collapsed lung. 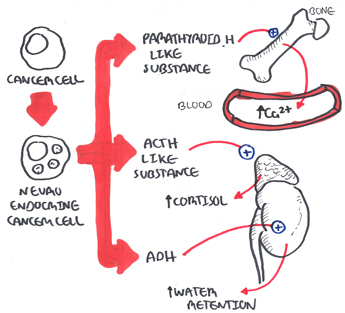 NSCLC 50% 2 year survival without spread, 10% with spread.